All students who live within the amended home zone as described below shall be entitled to enrol at the school. Starting at the junction of the Northwestern Motorway (SH16) and Carrington Road, travel east along SH16 to the Symonds Street overbridge. Travel south along Symonds Street (odd addresses 109 and above, even addresses 124 and above included, Glenside Crescent and Hohipere Street included) and turn south east onto Mt Eden Road. Travel south east along Mt Eden Road (odd addresses 919 and below, even addresses 826 and below included. Water Street, Kohutu Street, Hillside Crescent, Percy Street, Batger Road, Rautangi Road, Oakands Road, Poronui Street, Irene Avenue and Rahiri Road included) to Landscape Road. Travel west along Landscape Road (odd addresses 53 and above, even addresses 54 and above included. Kain Street and Rosedale Avenue included) and cross Dominion Road at numbers 886/815 (included) and continue west along lnvermay Avenue (both sides included) and continue south along Renfrew Avenue (included) to Mt Albert Road. Travel north-west along Mt Albert Road (odd addresses 303 and below, even addresses 310 and below included). Turn southwest into Sandringham Road extension (both sides included) then northwest along Stoddard Road (odd addresses 141 and above, even addresses 112 and above included). Continue on to Richardson Road (odd addresses 195 and below included, even addresses 198 and below included), cross New North Road (odd addresses 975 to 21, even addresses 1062 to 12 included) and travel north along both sides of Woodward Avenue (included) to Carrington Road (Jersey Avenue, Harbutt Avenue, Fairleigh Avenue, and offroads included; Springleigh Avenue and Raetihi Crescent included; Laurel Street addresses 30, 25 and below, Renton Road addresses 26, 23 and below, Rhodes Avenue addresses 24, 13 and below, Mark Road addresses 22, 29 and below included; Wairaka Precinct excluded). From Woodward Avenue travel north along the centre of Carrington Road (20-28, 50-56, 78-145 even numbers only included; off roads included; Farm Road and Unitec Campus excluded) to the SH16 0verbridge, back to the starting point. Out-of-zone enrolment applications for 2019 have closed. The ballot for applications was conducted on 12 September, 2018. 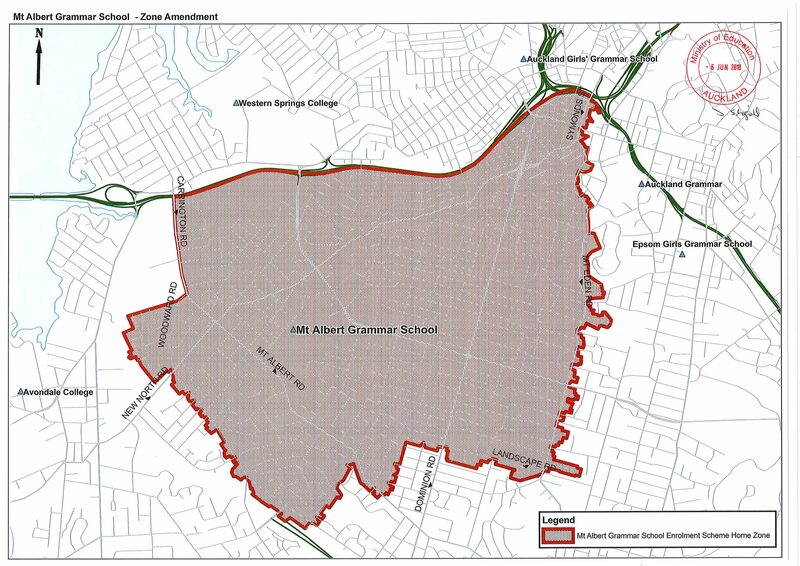 Due to increasing demand for places at Mount Albert Grammar School from families who live inside our school zone, the MAGS Board of Trustees reviewed the school’s out-of-zone priority list and decided that the 2018 out-of-zone ballot will be held only for siblings of current students (Priority 2) – a current student being one who is attending in 2019. Each year, the Board of Trustees will determine the number of places that are likely to be available in the following year for the enrolment of students who live outside the home zone. The Board will publish this information by notice in a daily or community newspaper circulating in the local area. The notice will indicate how applications are to be made and will specify a date by which all applications must be received. This priority is not applicable as this school does not run a special programme approved by the Secretary for Education. Fourth Priority will be given to an applicant who is a child of a former student of the school. Fifth Priority will be given to any applicants who are children of board employees. If there are more applicants in the first, second, third, fourth or fifth priority groups than there are places available, selection within the priority group will be by ballot conducted in accordance with instructions by the Secretary under Section 11G(1) of the Education Act 1989. Parents will be informed of the date of any ballot by notice in a daily or community newspaper circulating in the area served by the school. Applicants seeking second or third priority status may be required to give proof of sibling relationship.